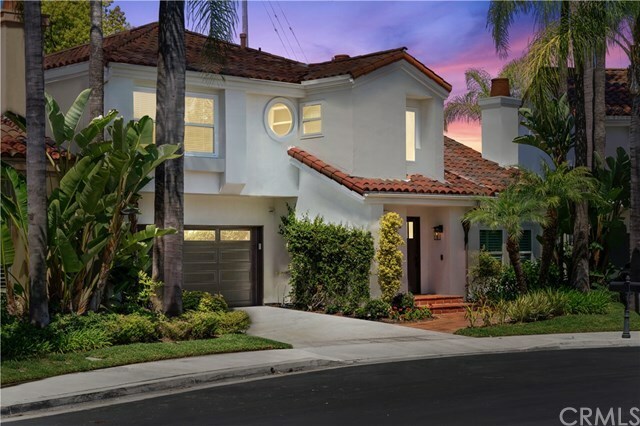 A beautifully renovated single-family residence in the desirable Newport Canyon neighborhood! Also, one of the largest lots in the resort-style, guard gated community. This charming property features 4 bedrooms, 3 bathrooms, and almost 2,300 square feet of living space. Upon entering, you are met with soaring ceilings in the open concept formal living and dining room. Marble fireplaces adorn both the living room and family room. The kitchen features stainless steel appliances, matching marble countertops, and a sunny breakfast nook. French doors in the family room and dining room open to a spacious wraparound patio, with plenty of room for entertaining or for kids to play on the side yard. There are wonderful views of the Back Bay from the master suite, complete with a soaking tub, walk-in shower, separate marble vanities and an oversized walk-in closet. Upstairs, you will also find two additional bedrooms and a den with vaulted ceilings that share a full bathroom. The den is currently being used as a playroom but can easily be converted to a fourth bedroom. Other amenities include a two-car garage with plenty of storage space, hardwood floors throughout the living areas, plantation shutters, and a separate, downstairs laundry room. The community has 24-hour security, a pool, spa, BBQ area, and more. Close proximity to restaurants and shops, and the Bonita Creek Park just across the street. This is a prime locale and one of the best values in Newport Beach!